The Division of Communications is interested in your thoughts on a variety of topics regarding Vanderbilt apparel. Your participation will help us to better serve you. The survey should take approximately 10 minutes to complete. As a “thank you” for your participation, you will be given a promotional code for 25 percent off of one Vanderbilt apparel item to be redeemed at vubookstore.com. This code will be available for use until Oct. 31, 2018, and you will receive it after completing the survey. 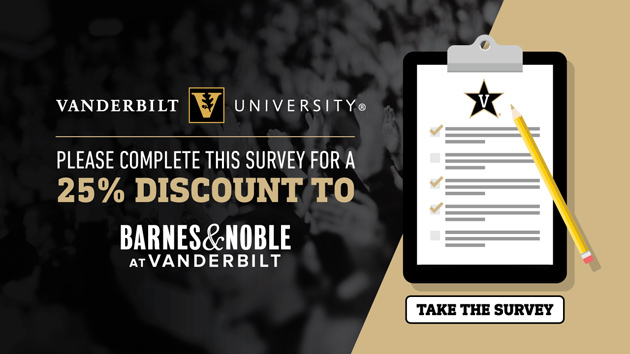 As a reminder, 10 percent off is the normal discount offered to all Vanderbilt faculty and staff at the Barnes & Noble at Vanderbilt bookstore. Please click here to complete the survey. Anchor Down!